Keane Southard (1987- ) is a composer and pianist whose work is influenced by a variety of styles including standard classical and pop and folk influences. This major debut disc is a fine sampling of his work though it is important to realize that his work is for diverse ensembles of pretty much every description and the present sampling is of music for wind ensemble. Just like every specialized grouping, be it string quartet, string orchestra, wind quintet, solo piano, full orchestra, etc., one encounters composers with varying degrees of facility in each configuration. Southard seems very much at home with the wind ensemble/band and its possibilities. A quick look through his extensive works list at his site suggests a hugely prolific musician with a wide variety of skill sets in a variety of musical configurations. Wind ensemble is clearly one of his strengths and the Northeastern State University Wind Ensemble of Oklahoma under conductor Norman Wika are up to the challenges. Southard playfully refers to this grouping as a “wind powered” ensemble using it as a metaphor for ecologically sustainable power systems. There are nine tracks of which three are transcriptions of other composers’ work and the remaining six are by Southard. His metaphors are as eclectic as his musical choices but fear not, his choices are friendly ones. The first track, Waltzing Dervish sets the tone as an original and substantial composition of some ten minutes duration in which he takes on the waltz and its various meanings both public and personal to create an original band composition concerned as much with ecological metaphor as with a striving for multicultural diversity in an optimistic and thoughtful exploration of what can easily be a tired dance form. The second piece is an arrangement of a piece by Francisco Mignone (1897-1986), one of the composers whose music he encountered during his 2013 Fulbright Fellowship in Brazil. The piece is scored for optional choir (not used in this recording) and band, an arrangement Southard made with the intention of sharing this music as a highly viable selection for concert band. It is indeed a joyous affair and one could easily imagine this being adopted as a staple in the rarefied realm of concert band music. Do You Know How Many You Are? is the composer’s 2013 band arrangement of a 2010 choral piece which he describes as having basically come to him in a dream. Claude Debussy’s Menuet (ca. 1890) was originally a piano piece which Southard envisioned in this orchestrated form during the course of his studies of orchestration. That sort of inspiration is not uncommon for a composer but the result is not always as ideal as the composer imagined. Fortunately this orchestration works quite well and again would proudly fit in a given band’s repertoire as an audience pleasing piece. The next piece, originally an orchestral piece from 2013 is presented in the composer’s own arrangement for band. No Interior Do Rio De Janeiro (2013/15) is another of the inspirations from the composer’s 2013 Fulbright Fellowship and was inspired by his work with “Orquestrando a Vida”, a Brazilian music project inspired by Venezuela’s famed “El Sistema”. The band version was written on a commission from the present NSU Wind Ensemble. Here is perhaps a departure from the dance theme of the first three tracks. It seems to be a thesis or musical diary entry reflecting his personal take on the experience of working with this project though the spirit of the dance remains throughout. Carousel (2008/2010) is the arrangement for band of the third movement of a mini-symphony (perhaps a scherzo?) for orchestra. Curiously he describes his inspiration as coming from the sound of the calliope, a sort of steam driven organ common in circuses of the late 19th and early 20th centuries. Cortège et Litanie (1922) by French composer and organist Marcel Dupré (1886-1971) is a bit of a departure. Neither a dance nor derived from Brazilian sources this piece was originally written for organ. The organ (like the calliope in the previous piece) is arguably a wind instrument and this transcription retains some of the ambiance of that grand instrument. It is among Dupré’s better known pieces and seems a natural for band. Uma Pasacalha Brasiliera (2015) is a commission from a the Arrowhead Union High School Wind Ensemble and conductor Jacob T. Polancich. The composer describes various influences in the circuitous path the the completion of this work but it is basically a sort of homage to the baroque form of the pasacaglia (variations over a repeating bass line) as well as to some of the great folk song influenced composers such as Percy Grainger. 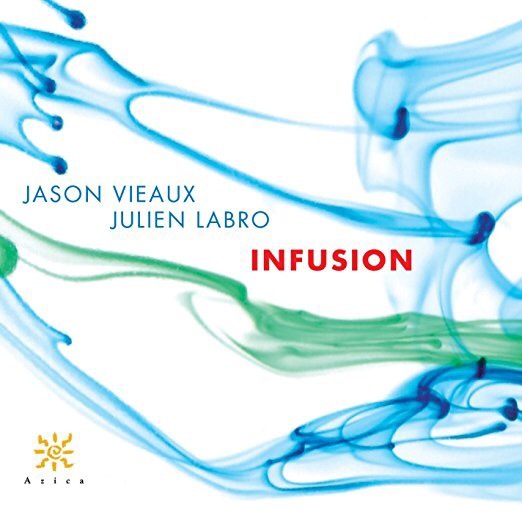 Brazilian influences dominate much of the composer’s work from this period and they combine with the aforementioned baroque and folk influences to form a wonderfully creative take on that form of baroque counterpoint. Finally the big finale is presented in another transcription, this time of a concerto for piano and organ from 2008. Of course the organ again lends it’s sound easily to a band transcription and we have this Concertino for Piano and Wind Band (2008 rev. 2015) which allows us to hear the considerable keyboard skills of the composer. This is the most substantial work on the disc and provides a satisfying finale to this portrait of a prolific and optimistic young composer at the very successful beginnings of what this writer (optimistically) hopes will be a long and productive career. John Corigliano (1938- ) is one of America’s finest composers. He is to classical music in New York what Woody Allen is to the movies. Corigliano is musical royalty. His father was concertmaster under Leonard Bernstein among others (in fact he apparently worked as assistant to the producer on several of the Young Peoples’ Concerts). His own accomplishments musically are many including a the very first Grawemeyer Award for his first symphony and a Pulitzer Prize for his second. One could hardly find another musician as deserving of being honored. From the very New Yorker style cover art this album affirms this composer’s iconic status. But the artists here are good Chicago Brass players. As a native born Chicagoan I have become accustomed to assuming that one can find some of the world’s finest brass players there and this album lays testament to that. 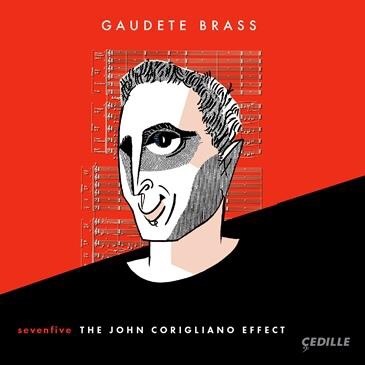 Gaudete Brass is an ensemble that definitely deserves your attention. This is a fine tribute album featuring mostly world premieres but also some nice transcriptions. This is effective though not overwhelmingly modern music for brass. It is intended as and functions very well as entertainment and, from the sound of it, is also fun to play. The original works are welcome as are the transcriptions of Corigliano’s Gazebo Dances. by the long time Chicago musician/conductor Cliff Colnot. (One transcription is by the composer). There are a total of three Corigliano pieces here and 13 by others. One can only imagine the joy the composer will feel on hearing these tributes and the joy that any number of brass players will experience hearing this fine album. As usual the Cedille recording is lucid giving a clear sound image of some truly fine musicianship. The pieces here are good middle of the road compositions which pose challenges on the players but manage to be entertaining and nothing here sounds like an academic exercise. Rather this disc is about celebration exactly as it purports. Very enjoyable disc.